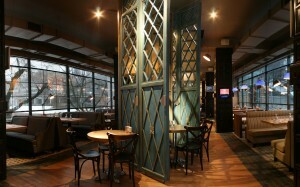 Part of Hotel Kazakhstan, The Noodles offers tasty food and a homely and relaxing atmosphere, either eat in or take away. The Noodles serves up Gloria Jean’s coffees, as well as the usual soft drinks, juices and cocktails. The international cuisine prepared by chefs from the countries represented on the menu includes pizzas, pastas, salads, burgers, sandwiches, noodles, teppanyaki and sushi. They have a very popular business lunch buffet for 1,500 KZT.